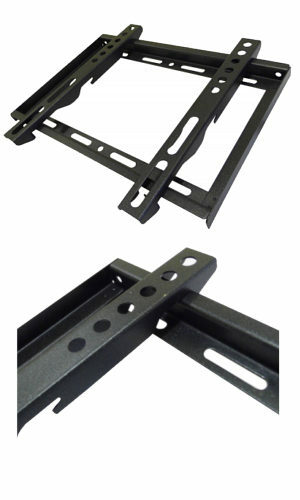 200 x 200 Fixed TV Wall Mount, for 14 to 37 inch TVs, Slim Profile. Fixed slim profile TV bracket. 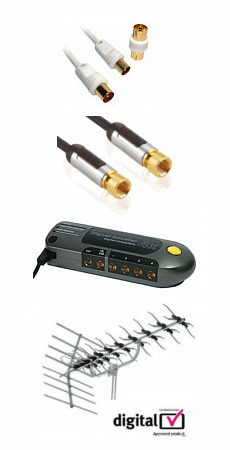 Suitable for the installation of plasma or LCD televisions/monitors with a screen size from 58 to 107 cm (23 to 42 inch). Integrated spirit level for fast and easy mounting. Cable manager provides organisation and necessary strain relief. Easy-Fix system for simple and fully adjustable orientation of your TV. Extremely unobtrusive and space-saving. Therefore ideal for home cinema use. With 2 movable carrier arms, for devices with threaded holes in a distance of up to approx. 46.5 x 32.0 cm. Supports all VESA standards up to 450 x 300. Size of the wall mounting plate: 59.0 x 27.0 cm. Can be tilted freely by 15 degrees. Technical Details: Variant: Motion. Quality: 5 Stars. Recommended Screen Size: 58 - 107 cm (23" - 42"). Max. Loading: 56 kg. Size: L. Model: TV. Line: Standard. Material: Steel Plate. Colour: Black. Hole-Size TV-Fastener: up to M10. Outside Dimension Depth (from): 7.3 cm. Outside Dimension Height: 33 cm. Outside Dimension Width: 59 cm. Outside Dimension Depth (to): 7.3 cm. Manufacturer backed 2 year warranty.